Campbell Macpherson has been enabling organisations to successfully instigate sustainable change for almost thirty years across the UK, Europe, US, Australia, Asia and the Middle East. He has a remarkable wealth of experience across a variety of industries and business disciplines. He has been a trusted adviser to CEOs and leadership teams, board member, Strategy Director, HR Director, Marketing Director, eBusiness Head and internal change leader. Campbell believes passionately in the power of clarity and aligning people to deliver. Your people are the only ones who can deliver your strategy. 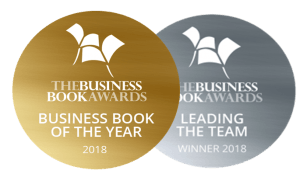 What drives him is a burning desire to make a positive difference to the way that organisations work and the impact they have on their customers, employees and shareholders. Senior Adviser to one of the world’s largest Sovereign Funds, specialising in organisational and strategic change. He has also advised dozens of other companies on strategic and organisational change including IFDS (State Street & DST), International Personal Finance, Friends Life, Aviva, Gocompare, iPipeline, James Hay, Cofunds, Sesame, Misys, Openwork, Centaur Media, Capital Radio, BBC, Telewest, American Express and Lazard. He founded one of Australia’s first multimedia marketing companies. He also flew jets (poorly) in the RAAF. He has a Physics degree from Melbourne University. Campbell has written feature articles for numerous publications including IOD Director, Minute Hack, AMBA Ambition, Management Today, HR Director, Strategic HR Review, Money Marketing, FundWeb, CIMA’s Financial Management magazine, ACCA’s Accounting & Business, CCR Magazine and others. To peruse the published articles, go to the ‘In the Media‘ page of this site. 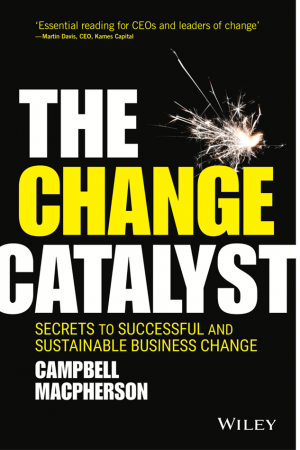 Campbell is the author of the 2018 Business Book of the Year, published by Wiley – ‘The Change Catalyst (secrets to successful and sustainable business change)’. Available on Amazon.com, Amazon.co.uk and Booktopia.com.au. He is available for speaking engagements. Campbell lives in Oxfordshire, UK, and is married with two adult children. He divides his time between the UK, Australia and wherever his clients need him to be. ADIA: Enabled transformation of the impact and value that the Evaluation & Follow up Division added to the Investment Committee. NB: The division reviews and comments on every submission and investment proposal that goes before the Investment Committee. Conducted advisory projects for the Investment Committee and IC members on matters of strategy, approach and governance. Led International Peer Reviews for the IC leadership to leading institutional investors. IFDS: Established two new market-leading businesses for this JV between State Street and DST: IFDS Platform Solutions and IFDS Retirement Solutions. Aligned the new leadership teams and led business development as an ad-hoc executive. iPipeline: Enabled global CEO to enter the UK market through acquisition and assisted with the development of the newly acquired business. BP Northbound: Director of this family business from 2011-2015. Assisted MD to replace manager and invest in business – doubling the revenue to $1m per week and tripling EBITDA over 5 years. BP Queensland’s largest independent forecourt. Business successfully sold in 2015. Zurich Life: Strategy Director for Zurich International Life and Global Life Emerging Markets across ME, Asia, CEE and Latam. Led expansion office and commercial team. Researched CEE and India. Opened offices in Taiwan and Doha. New propositions. Established Business Plan for entry into Indonesia. Sesame: Led the creation of the UK’s largest IFA Network out of the 5 that Misys had acquired. Then joined board. Transformed HR into an award-winning department. Guided the business through several transformations. Andersen Consulting: Senior Manager, Change – creation of AMP global eBusiness department and transformed AMP’s approach to eBusiness across insurance and online banking. 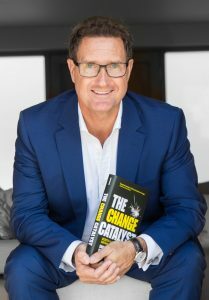 ‘The Change Catalyst’ published worldwide by Wiley. Available on Amazon.com, Amazon.co.uk and Booktopia.com.au.